An article on the McKinsey & Company website caught my attention. It’s titled “Arianna Huffington on the link between leadership and well-being.” Huffington is the founder of the Huffington Post and Thrive Global, which I would describe as a kind of Oprah-like self-improvement site. In the piece Huffington makes the case that a better rested, less stressed-out executive or employee results in greater individual and collective performance. If we continue to congratulate employees for working 24/7 or for being always on—then we are ignoring the science. We are ignoring the fact that they’re operating in an impaired state, that being up for 24 hours is the cognitive equivalent of being drunk. My goal is to create new role models, and to bring business leaders, media leaders, and country leaders who are admired, and have them talk about how, in fact, when they prioritize their own well-being—when, as they tell us on airplanes, they put their own oxygen mask on first—they’re more-effective leaders. The standard practice when somebody goes on vacation is to put an out-of-office message on, and you get that truly useless out-of-office email from someone. Then five minutes later, more often than not, you get an email. Because we’re all kind of programmed, once we see an email, to respond. So Thrive Global created an app that allows you, if you opt in as an employee or as an individual, to have your emails deleted during vacation. Suddenly, you have this magical experience of zero emails in your inbox for the duration of your vacation. And everybody who’s done that, including me, can testify to the fact that you return to work deeply recharged. It’s long been known that all leadership behavior relies on at least one (and often more than one) of these executive functions and therefore, in particular, on the prefrontal cortex. Neuroscientists know that although other brain areas can cope relatively well with too little sleep, the prefrontal cortex cannot. Although basic visual and motor skills deteriorate when people are deprived of sleep, they do not do so nearly to the same extent as higher-order mental skills. Previous McKinsey research has highlighted a strong correlation between leadership performance and organizational health, itself a strong predictor of a healthy bottom line. In a separate study of 81 organizations and 189,000 people around the world, we have found that four types of leadership behavior are most commonly associated with high-quality executive teams: the ability to operate with a strong orientation to results, to solve problems effectively, to seek out different perspectives, and to support others. 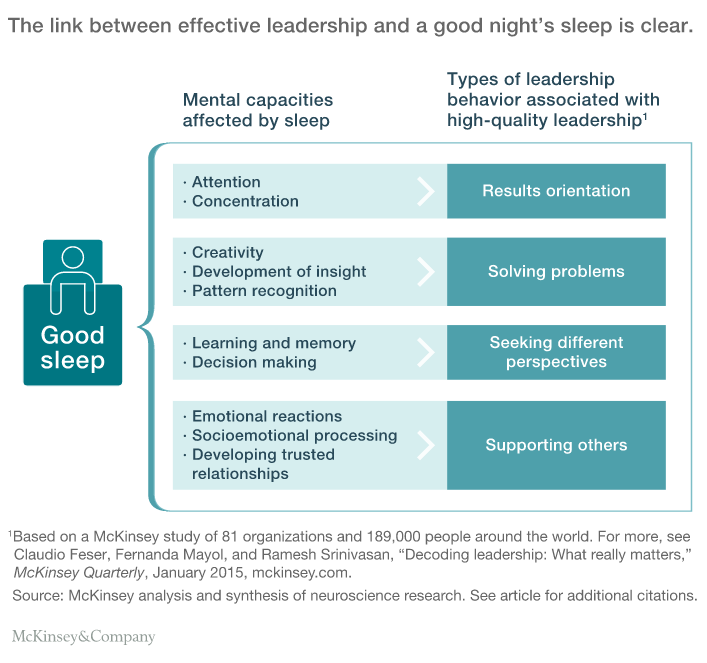 What’s striking, in all four cases, is the proven link between sleep and effective leadership. Napping rooms or pods. The image of a sleeping manager is easy to mischaracterize. Research has shown that a short nap of 10 to 30 minutes improves alertness and performance for up to two and a half hours.9 Over half of the leaders in our survey wanted their businesses to imitate the large technology companies and telcos that have already successfully adopted sleep pods and nap rooms. “Hypocrisy” because while it is all well and good for leaders to discuss these issues, such good intentions usually fall by the wayside once they walk out of the seminar room or once the next “urgent” issue hits their organization. Even as the leader sends communications to the organization about the importance of proper rest, lower down in the food chain the foot soldiers usually must deal with middle and front-line managers who know they will definitely get in trouble if they miss a deadline but also know they will probably not lose their jobs for causing staff to lose a little sleep. The word “hypocrisy” thus creeps into the minds of the frontline staff as they see the gap between the reality of their situation and the rhetoric of the executives. I mention “dual class” because I have no doubt that in some progressive organizations, some employees are, or in the future will, benefit from a more enlightened approach to total employee productivity, effectiveness and engagement. But I am also thinking about the many people working in the precarious economy. There may be some who are trying to make this “gig” economy sound progressive, but for the vast majority of people I know who work in this way they often do not have the luxury of sleep. Instead, they piece together an income from 2, 3, even 4 jobs and spend inordinate amounts of time on public transit. The sleep they are getting is on the train, bus or inadvertently on the job itself. I know McKinsey and Arianna Huffington meant well, but they are rubbing shoulders with, and speaking to, an audience whose lives are vastly different than the frontlines of the economy. The real issue is that for many people sleep is not a tool for peak performance, it is a luxury they cannot afford.